I am author Tarrin P. Lupo and I want to first state that there are a lot of people out there trying to change the system of government from within. While I admire anyone’s efforts to take on that task it honestly amounts to beating one’s head against the wall. The fact is this system does not wish to change. It is an extremely profitable and protected business to be a politician nowadays and most of them will neither cut themselves short nor keep laws within the realm of “small government”. You will find Tarrin P Lupo’s book on the excellent Step With Life website in the Living Systems Tab – it’s usually about the 6th book down in the books section immediately below the script. Living Proof Frizz Styling System for Thick to Coarse Hair (can you see how that one got in there . . .can you?) God love the Internet! And there are plenty of other great titles on Step With Life. It’s a little Back market business run by Dr Quantum. 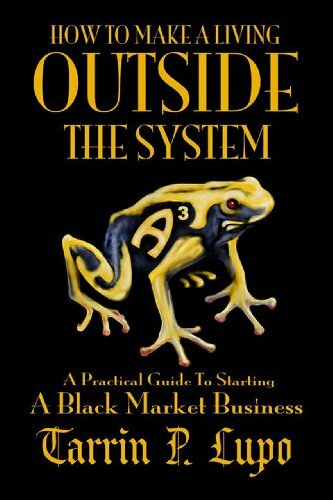 Yes it’s a A Practical Guide to Starting a Black Market Business outside the system – just don’t tell anyone.